You'll be £12.99 closer to your next £10.00 credit when you purchase The Peninsular Collection - The Keys of Spain. What's this? 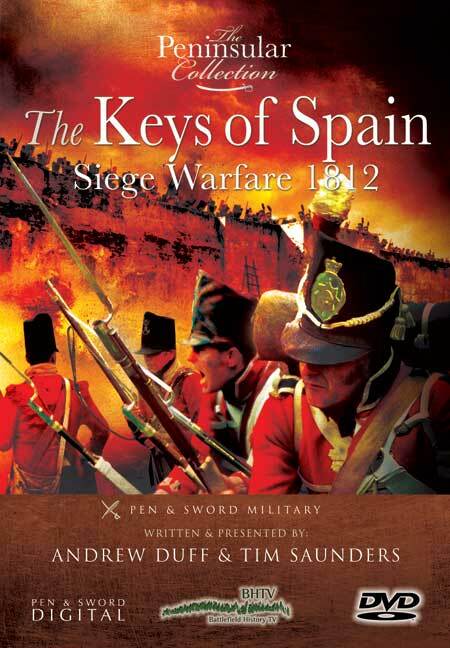 The Keys of Spain – Siege Warfare is the next DVD in The Peninsular Collection from BHTV and Pen and Sword Digital. Building on events described in the Salamanca DVD, the BHTV team explain the siege warfare tactics of the British and the French during the period and explore the build up and epic battles fought in Spain before the Battle of Salamanca in July 1812. At the end of 1810, the defensive lines that Arthur Wellesley, later the Duke of Wellington, had built with great secrecy at Torres Vedras halted the French Army in its tracks. In the Spring the following year the British attempt to besiege Badajoz failed badly. These facts underline the importance of fixed defences in the rugged terrain of the Peninsula where there were few roads, and that the British had little practical knowledge of siege warfare at the time. These problems would have to be overcome if, in 1812, Wellesley was to go onto the offensive and invade Spain. The two great French-held Spanish border fortresses of Ciudad Rodrigo and Badajoz stood in the way as the Keys to Spain. This film explains the theory and practice of siege warfare in the Peninsula both from the perspective of the defender and the attacker before covering the speedily conducted siege of Ciudad Rodrigo and the far more severe test at Badajoz, with its terrible storm of the breeches and the dreadful aftermath. Complete with expert analysis of the battles and battlefields, as well as authentic re-enactment footage and expertly drawn maps, this DVD is perfect for all Peninsular War historians and those with an interest in this turbulent period. The photography, ariel and ground level is striking... The DVD demonstrates the hardships and bloodshed of siege warfare in the Peninsula very well. From the middle of March until mid-April 1812 Arthur Wellesley, the newly appointed Earl of Wellington, and his Anglo Portuguese army besieged the formidable fortress of Badajoz. This was the second siege of the new year in what was at the time referred to as struggle for ‘The Keys of Spain’.